We’d love your help. Let us know what’s wrong with this preview of Square One by Mohamed Shafiek. After failing to become the mangaka Akari Ise has always dreamed of being, he is given one last chance to prove himself as a proposition to become a manga assistant arises. Upon being assigned to one of the biggest names in the manga industry, Akari finds his new coworkers to be something more out of a circus than a group that aspires to the same goals he does. As his new After failing to become the mangaka Akari Ise has always dreamed of being, he is given one last chance to prove himself as a proposition to become a manga assistant arises. Upon being assigned to one of the biggest names in the manga industry, Akari finds his new coworkers to be something more out of a circus than a group that aspires to the same goals he does. As his new race to becoming a mangaka begins, Akari finds that there might be more to being one than what he originally thought. The author, Mohamed Shafiek, is an up and coming manga artist in the US, as well as a spontaneous light novelist. To ask other readers questions about Square One, please sign up. This book somehow reminds me of Bakuman but it's written from the non-Japanese mangaka perspective living outside Japan. According to the author, he said that this book was written based on his personal experience as a comic artist. But for some reason, I find that some of the characters don't seem to make much sense at all. That makes me wonder if he wrote the story based on the people that he came across while working or their characters are based on the common trope in anime. Well, it's possi This book somehow reminds me of Bakuman but it's written from the non-Japanese mangaka perspective living outside Japan. According to the author, he said that this book was written based on his personal experience as a comic artist. But for some reason, I find that some of the characters don't seem to make much sense at all. That makes me wonder if he wrote the story based on the people that he came across while working or their characters are based on the common trope in anime. Well, it's possible that people with that kind of personality do exist in his line of work. I guess that we'll never know about that. I enjoy reading this book. But if only the author is doing his due diligence to name the character correctly. There are many free tools out there to create a Japanese name. He should be using that instead of slapping name that sounds like a Japanese name but it's not. It's fine for the pen name, but not for the real name. Simply put, Square One is a tremendous light novel from beginning to end. The characters are written brilliantly and they each drive the story forward. Every character has a unique personality, a backstory, and an event throughout the novel that makes you feel a deep connection to them. Every little bit of their development only aids the main, overarching story and helps flesh it out in an interesting way. While the main story’s premise isn’t really in-depth, it’s not meant to be. The whole poin Simply put, Square One is a tremendous light novel from beginning to end. The characters are written brilliantly and they each drive the story forward. Every character has a unique personality, a backstory, and an event throughout the novel that makes you feel a deep connection to them. Every little bit of their development only aids the main, overarching story and helps flesh it out in an interesting way. While the main story’s premise isn’t really in-depth, it’s not meant to be. The whole point of the novel is to take the reader on a journey. The journey has a clearly defined beginning and end point, but it’s all the events in between that get you hooked. This book is terrible from beginning to end. It's rife with typos, grammatical and punctuation errors, inconsistent verb tenses, unnecessary adverbs, sentence fragments, and words that aren't used correctly. But those are only some of the more minor issues of this novel. Its characters are cardboard cutouts of common anime tropes, and none of them are particularly developed or likable. They're all rather stupid as well, abandoning common sense during times of drama for the sole purpose of having This book is terrible from beginning to end. It's rife with typos, grammatical and punctuation errors, inconsistent verb tenses, unnecessary adverbs, sentence fragments, and words that aren't used correctly. But those are only some of the more minor issues of this novel. Its characters are cardboard cutouts of common anime tropes, and none of them are particularly developed or likable. They're all rather stupid as well, abandoning common sense during times of drama for the sole purpose of having those times of drama. 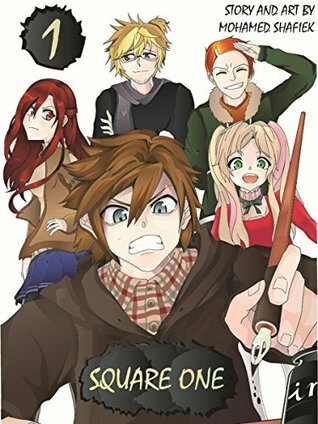 There's very little substance to its chapters, with a good portion of them being filler and pointless scenes focusing on minor characters who have nothing to do with the plot at hand, and the climax is so full of plotholes it's incredible that this is being sold as a book and not Swiss cheese.